Build customer-grade custom mobile apps more efficiently thanks to the completely redesigned Mobile channel. The Mobile channel now dynamically renders options, supports several enhancements to the Pega Infinity Mobile Client™, and provides custom mobile app options that are arranged in a more intuitive, consistent, and convenient way to help provide direct access to the custom mobile app settings. By default, custom mobile apps that you configure within the Mobile channel are generated with Pega Infinity Mobile Client. You can also build a custom mobile app with Pega Mobile Client 7, or select a specific version of the client application, for example, to avoid compatibility issues with the devices in your organization. 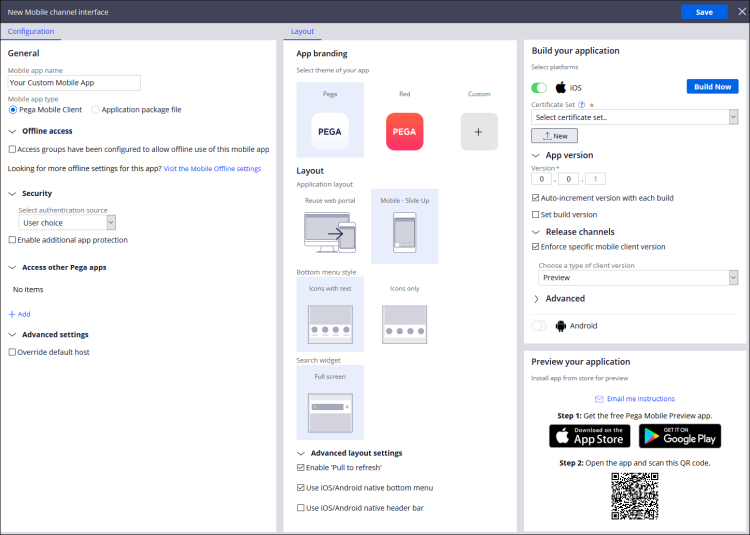 When you build custom mobile apps with Pega Infinity Mobile Client, you can reuse an existing single webview web portal or a multi webview application layout, and then configure such options as: the bottom bar navigation rule, the bottom bar style, and the full screen search widget. The new settings also include switches for activating pull-to-refresh feature and native user interface components for better integration with mobile devices. No matter which client application you use, you can instantly configure the custom mobile app security. You have options to: select and configure an authentication source, define additional custom mobile app protection features, and configure login and inactivity timeouts. For more information, see Configuring a custom mobile app.